By making use of the latest advancements in sustainable wastewater treatment combined with the creation of their own bacterial strains developed in-house, SewTreat are able to answer the needs of industrial, construction and mining operations with efficient, affordable and eco-friendly waste water treatment solutions. SewTreat is a proudly South African company offering specialized, modular biological waste water treatment plant designs tailor-made for the South African and African market. Their approach is based on return activated sludge technology incorporating submersed aeration media. This enhanced bacterial action ensures a highly effective treatment process boasting a very low carbon footprint, minimal capital input and low maintenance requirements. “Our approach is to treat nature with nature through sustainable engineering solutions that are evident in our superior proprietary biological technology. The modular design of our treatment plants makes us a leader in providing waste water treatment solutions for the African continent,” says SewTreat Managing Director and spokesman, Theunis Coetzer. Although the company is newly formed, SewTreat has already become an established name synonymous with international expertise in providing quality products and services to all sectors throughout Sub-Saharan Africa and especially in the SADC region. The SewTreat team consists of process and civil and process engineers, microbiologists, project planners and a network of distributors with over 35 years of experience in the field. SewTreat offers several modular waste water treatment plants tailored to meet the needs of industrial sized, mining and construction operations. The plastic range makes use of plastic ‘Jo-Jo’ type tanks that are connected in series or parallel depending on site space requirements or layout. The plant is wholly constructed and cold commissioned before delivery to client premises. The installation time required onsite is minimal – a 50kl per day plant can be assembled on site in less than five days. A guarantee of up to 20 years is offered on the tanks depending on the type of tanks used in the plant. 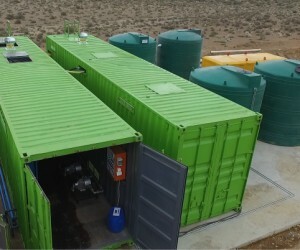 “We developed this range based on a need we saw in the market for a more cost effective solution for sewage treatment.,” Coetzer explains, although he notes that while the plastic plants are cost effective in term if capital expenditure, the do carry very high shipping costs and so he does not recommend them for installations outside of South Africa. The containerized plant is well suited to rugged African conditions. The concept is based on a ‘plug and play’ design, Coetzer explains, saying that they are designed for ease of transport, security and modularity, taking into consideration that the plant may be moved to various locations. “The complete WWTP is built into ISO High Cube Containers. The plants are can be easily moved from site to site, can be easily expanded and have a once off cost to the client as they can be moved from site to site as needed,” says Coetzer. “Our recent upgrade of our design makes this a very competitive option for onsite waste water treatment. The plant is wholly constructed and tested at our 5000m² under-roof facilities which ensures that all boxes are ticked in terms of quality control procedures. 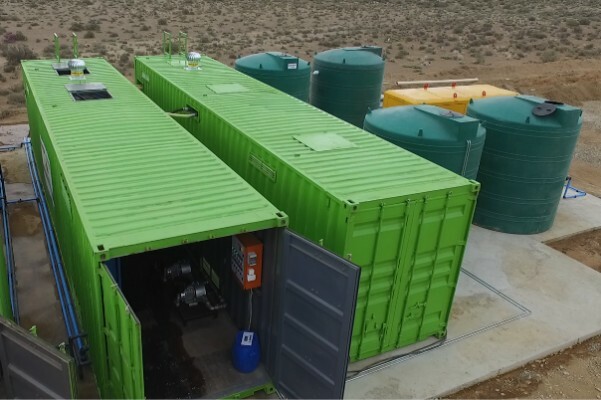 The containerized plant offers a life span of 15 to 20 years which is excellent for a plug and play solution,” says Coetzer explaining that installation literally requires only connecting of pipes to the waste water treatment plant. Their civil constructed plants are designed and constructed mostly for large flow industrial and housing development applications. The plants are aesthetically pleasing as they are constructed underground and can be covered with vegetation and are entirely civil designed and constructed to exact civil engineering requirements. These plants boast several advantages for clients including the fact that the civil construction can be subcontracted to local contractors to reduce construction costs. Coetzer explains that provision can also be made for easy plant expansion through simple modular and common wall construction and that if the plant is gravity-fed, the system can operate without electricity for up to 48 hours. This makes the product an effective alternative for remote operations, for countries with unreliable power supply, or where no municipal connection is available. Biological waste water treatment is an accepted practice used worldwide. The process involves confining naturally occurring bacteria at a very high concentration in the treatment process, whether it is plastic type, containerized type of civil constructed type. From here this bacteria, together with some protozoa and other microbes (collectively referred to as activated sludge) are treated in an anaerobic and an aerobic process. They are then returned to the anaerobic phase to eliminate sludge accumulation and waste generation.